There are so many rules and etiquette guidelines that you can follow when setting your dinner party table. Fine bone china and crystal glasses are not pre-requisites but keeping everything looking good definitely is. The amount of cutlery and plates you use will depend on the type of dinner party being held and the sort of guests you will be inviting. If you are having a few close friends round then you may wish to dispense with formality. They will surely forgive you for any breaches of the etiquette rules! If the guest list consists of business associates or people you do not know that well then pay close attention to the rules. In general glasses should be placed to the right of the setting. Depending on the type of event you are having you can have up to three glasses: red, white and water, and maybe, for those special occasions, a champagne glass. It is customary to have a charger plate to define the setting, although it is not strictly necessary. If you do go for this option, place a main plate on top of the charger and a bread plate to the left, with a separate knife for this. The cutlery used will depend on the type of dishes served. We all know the order – start from the outside and work your way in. There are however, different types of cutlery for different dishes. For example, if you are serving fish, make sure that you have the correct implements available for your guests. Don't overlook this kind of detail - your guests may well notice. 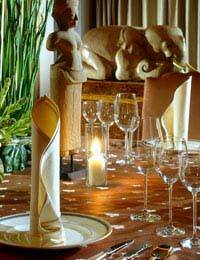 Once you have dealt with the technical aspects of setting the table, consider the look and feel. Executed well, this will make the biggest impact of the night! Think about implementing your seating plan in an original way. You could always tie up the cutlery with gauze and insert a place card between the knife and fork. This is a pretty and unique way of letting your guests know their place. Another idea is to get some dried flowers and a line of faux pearls and tie them together. Place a hole in the top left hand corner of a place card and tie the end of the pearls through it and knot the pearls. You may have to invest some time preparing this but the pay off is an expensive looking display. The plates and cutlery themselves should fit the theme. If the dinner party is very relaxed and, for example, has an eclectic theme, mismatched plates can be forgiven. If the dinner party has a high-class theme then the plates and cutlery should be the finest in your collection. Each table should have a centrepiece. Keep it simple with a glass vase, coloured glass stones and a string of beads floating through the water. Alternatively, spend time and money preparing something special. A mirrored centrepiece adds some sparkle to the table and with a smattering of candles; the table will be full of flattering light. Get a mirrored tray and place flower petals and scented gel candles on top of it. An oversized champagne glass can be placed in the middle with either a candle floating in it or full of glass stones is an elegant touch. As you can see, it’s all about effort. You don’t need to spend an absolute fortune to create a table or an atmosphere to remember. The right lighting and use of accessories will leave your guests, whoever they may be, seriously impressed with your hostess skills.